BUTLER TOWNSHIP – Butler Township police have a new tool in the fight against crime as K-9 Zorro was sworn in at Wednesday’s Township Trustees meeting. Officer Amy Carter will be Zorro’s handler. 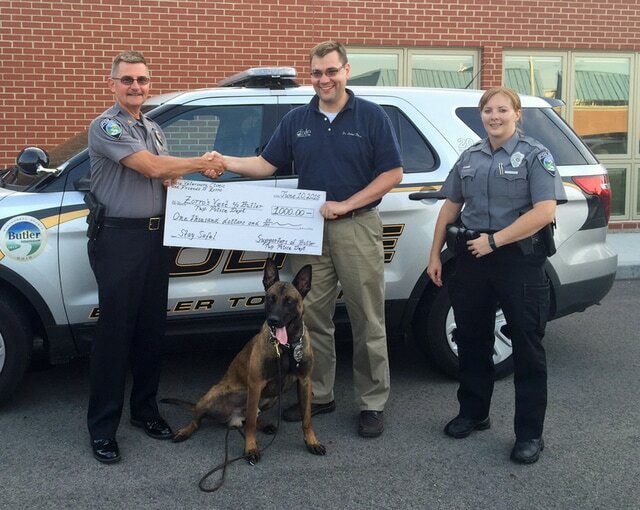 Veterinarian Jason Thorn, owner of Dixie Veterinary Clinic, presented Carter and Police Chief John Cresie a check for $1,000 to purchase a bullet proof vest for Zorro. The funds were raised by Thorn and businesses in the Township. Thorn’s clinic has agreed to provide veterinary services for the K-9 at no cost to the Township. Cresie also recognized Vandalia American Legion Post 668 for a donation of $2,000 to help with the start-up costs of the K-9 program. Commander James McKenzie presented Cresie with the check a few weeks ago. Cresie was appreciative of the support the community has shown for the K-9 program. “Without their support, there is no way that we could have gotten this project off the ground,” he said. The Vandalia Drummer News has an interview set up for Thursday with Officer Carter and Zorro. Check back for updates on this story.